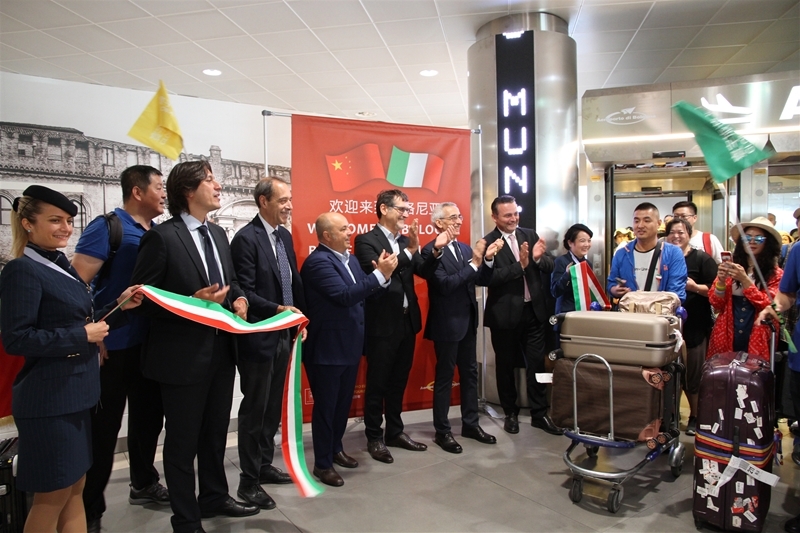 The first direct flight from Shenyang has landed this morning in Bologna with 240 passengers ready to explore the city and its cultural excellence. 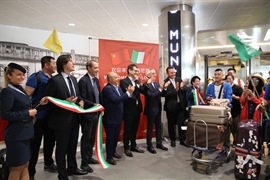 The first direct flight from China has landed in Bologna at 8.00 this morning after a 10-hour flight from Shenyang, capital city of Lianoning. The 240 passengers were welcomed by Enrico Postacchini, Chairman of Bologna Airport, Antonello Bonolis, Business Aviation and Communication Manager, Virginio Merola, Mayor of Bologna, Raffaele Donini, Regional Minister for Transport, Stefano d'Aquino, Bologna Welcome Commercial Manager, Remo Della Porta, Blue Panorama Airlines CCO and Angelo Morano, Welcome Chinese COO. The “China Program” will then follow with the direct connection from the city of Taiyuan (capital city of Shanxi), scheduled next July 22nd. Passengers from the first direct flight from China are therefore ready to explore Emilia Romagna’s capital city, Italy and Europe. On their landing in Bologna, they were all offered a gadget dedicated to the city and “Promenade in Bologna”, a booklet in Mandarin. The new routes are operated by Italian carrier Blue Panorama Airlines with Boeing 767-300 ER (267 seats including 8 business-class seats) and are sold as charter flights by Phoenix Travel Worldwide with package travels from Italy to Europe with arrival and departure from Bologna. Bologna Airport now aims at launching legacy flights as well on new Chinese routes to serve incoming tourism to Bologna and Italy and outgoing traffic to China for business or leisure purposes. In order to achieve this goal, it is necessary that Italian and Chinese Governments reopen their bilateral agreements to include Bologna among the authorized airports to receive new legacy flights from China. The group of 240 passengers are engaged in a two-week tour where Bologna stands as the first and the last stay. Thanks to the arrangements of Bologna Municipality and Bologna Welcome, the tourists have spent today’s first part in a two-hour guided tour to discover the cultural excellence of the city’s historical center and having lunch in a typical restaurant. After the two-week sightseeing in Europe, the group will visit FICO - Eataly World and will spend their last night before their flight back in Bologna. This first initiative aims at positioning Bologna as the ideal gateway to visit Europe and it is the occasion to start cooperating with an important tour operator to shape the city’s Chinese-dedicated tourist offer in view of potential developments supported by direct connections. On this occasion, Bologna turned out to be such a highly-appreciated destination that it deserved two half days and a night stay in a two-week tour boasting such world- famous destinations as Venice, Rome and Paris. This result was achieved through the efforts that tourist operators have been making to open Bologna to the Chinese market: international fairs, in China as well, cultural initiatives such as Zhang Dali’s exhibition at Palazzo Fava and a number of ad-hoc services dedicated to Chinese visitors introduced by the “Welcome Chinese” project, an important acknowledgement issued by the Chinese Government that enables only authorized structures to enter the Chinese market through China Tourism Academy, an agency of Chinese Tourism Ministry. China accounts nowadays for the largest market in the world in terms of expenditure and the second largest as travel organizing. In 2017 it reported a growth of +27% for Bologna and +16.2% in the first five months of 2018. “Today – said Stefano Bonaccini, President for Emilia-Romagna Region – Emilia-Romagna is opening its main entrance to China. This is one of the main tourist sources in the world and a Country our firms have been looking at with increasing interest for their innovative and high-quality products. Last November I was in Beijing when the Agreement with Bologna Airport was signed and now we are faced with a great chance to take in full. We have our house in order to proceed, considering we had 57 million tourists in 2017 and prestigious Lonely Planet awarded Emilia Romagna as Best in Europe 2018, rating it first among the ten destinations to visit in Europe. Finally, according to financial estimate, this year Emilia Romagna may be the first region in Italy for economic growth for the fourth consecutive year. Teamwork between social partners and territory: it has been performing very successfully and we intend to continue this way”. “Direct flights from China mean our territory-system has achieved its goal – said Virginio Merola, Mayor of Bologna – and, at the same time, they point to a new and important target our Airport is pursuing as regards legacy flights. I warmly greet the tourists who are going to arrive this summer and I welcome them. They’ll find a dynamic city, strongly rooted in Europe, and a territory enhanced by many initiatives coming from the work of Destination Bologna". “Till yesterday, – said Enrico Postacchini, Chairman of Bologna Airport – direct connections to China were only offered by Rome and Milan. With these new flights, Bologna Airport confirms once more its international importance and a strong presence in Eastern Europe, Russia and the East. Today’s result has been steadily pursued together with our territory and tourist promotion agencies. Thank you to all of them who have cooperated with us in the last few months and thank you to all the Airport people who have made it possible to start the new connections”. "The flight that has landed this morning – said Celso De Scrilli, Chairman of Bologna Welcome – is the first actual success attained through the initiatives that the city of Bologna and Bologna Welcome have been taking for some years to approach Chinese tourist market and attract visitors. We aim at improving the quality of the experience offered to the tourists coming from China showing them the extremely rich cultural heritage of Bologna and granting the city a sustainable and high-quality tourist development." “Today’s arrival of Blue Panorama flight – said Angelo Morano, Welcome Chinese COO - confirms the extraordinary work done by all the partners, both public and private. It is a unique chance for this territory to become more popular in China. Welcome Chinese is proud to count among its members the city of Bologna and Bologna Airport since 2017 and to have coordinated the process with Chinese Civil Aviation. This important goal is the first one in the number of targets to be achieved by the stakeholders”.